World Wide Trades are one of the biggest manufacturers, traders and exporters of a wide range of high quality Jute Products. Our product range includes Jute Bags, Jute Products and Jute Ribbons. 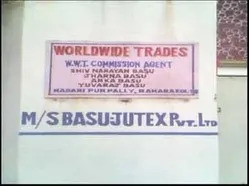 Basu Jutex Pvt. Ltd. are a professionally managed company and since the day of our establishment, we have been offering an efficient range of jute products to our clients. Our products are manufactured using premium quality jute grown in the best fields of the country. Jute products offered by us are quality tested at various stages of development to meet varied needs of our clients. Backed by a team of efficient engineers and designers, we are able to produce wide range of products as per international standards. People working with us belong to different background and have an expertise in their own works. Our sprawling and spacious infrastructural support enables us in meeting the demands of our clients. The latest machinery and other technical aspects available at our manufacturing unit is our strength in making flawless and defect free products. Products offered by us are widely appreciated by our clients for their superior quality, creative design, lightweight and durability, We offer our products in customized forms as per the specifications of our clients. Competitive pricing of our products and their design patterns makes them a desirable product for everyone. Trading, Importer and Exporter of Jute Products. 2014-15 Rs. 1 - 2 Crore Approx. 2013-14 Rs. 1 - 2 Crore Approx. 2012-13 Rs. 1 - 2 Crore Approx. To meet the needs and demands of nature friendly bags and other products, we stepped into the business of manufacturing and exporting Jute Products and grew up as an acclaimed group in the industry. Our products are manufactured in accordance to international quality standards to meet the requirements of quality conscious clients. We use premium quality raw jute for manufacturing our products and these products are stringently tested for quality by our quality analysts. High end and sophisticated machinery enables us in developing defect less products. Being leaders in manufacturing and exporting high quality Jute Products, we are able to come up with a wide assortment of products those are acclaimed for their quality, durability, efficiency and cost effectiveness. 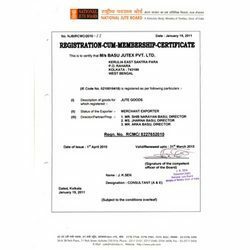 Our team of qualified and highly experienced professionals enables us in manufacturing products as per demands of clients in national and international market. People working with us are self motivated and belong to diverse backgrounds and have expertise in their own work. We have divided our complete work force into small units to meet the targets and maintain the work flow in the company. Our ultimate motto is to provide our esteemed clients with premier jute yarn and jute products at the most affordable prices. We promote healthy and transparent trade practices with our esteemed clients that provide us an edge over our competitors. We are also contributing to the development of this sector in collaboration with Syndicate Bank by providing necessary tips on agriculture and nursery. We are one of the industrial leaders engaged in manufacturing a wide assortment of Jute Products. Our clientele is spread in national as well as international markets. Our core competency lies on attaining complete customer satisfaction by providing quality products to our clients as per their specified requirements. We have managed an ethical and systematic procedure in our firm to meet client’s satisfaction and analyzing their requirements to offer them with product of their desire. We have devised easy payment modes in our company for our clients. We are internationally acclaimed manufacturer and suppliers of high quality Jute products. pour products are manufactured using premium quality raw materials and latest machines.